China said on Friday the joint declaration with Britain over Hong Kong, which laid the blueprint over how the city would be ruled after its return to China in 1997, was a historical document that no longer had any practical significance. In response, Britain said the declaration remained in force and was a legally valid treaty to which it was committed to upholding. The stark announcement from the Chinese Foreign Ministry, that is sure to raise questions over Beijing’s commitment to Hong Kong’s core freedoms, came the same day Chinese President Xi Jinping said in Hong Kong the “one country, two systems” formula was recognized “by the whole world”. It was not immediately clear if Foreign Ministry spokesman Lu Kang was attacking just the idea of continued British involvement in Hong Kong, which marks the 20th anniversary of Chinese rule on Saturday, or the principles in the document. The Sino-British Joint Declaration, signed in 1984 by then British Prime Minister Margaret Thatcher and Chinese Premier Zhao Ziyang, laid out how Britain would end its century-and-a-half long rule over Hong Kong. It also guarantees the city’s rights and freedoms under the “two systems” formula. Under Hong Kong’s mini-constitution, the Basic Law, Hong Kong was guaranteed its freedoms for “at least 50 years” after 1997. Lu told reporters during a regular briefing on Friday that the document no longer binds China. “Now Hong Kong has returned to the motherland’s embrace for 20 years, the Sino-British Joint Declaration, as a historical document, no longer has any practical significance, and it is not at all binding for the central government’s management over Hong Kong. The UK has no sovereignty, no power to rule and no power to supervise Hong Kong after the handover,” Lu said. Britain said it had a legal responsibility to ensure China abided by its obligations under the declaration. “The Sino-British Joint Declaration remains as valid today as it did when it was signed over 30 years ago,” a British Foreign Office spokeswoman said. On Thursday, British Foreign Secretary Boris Johnson said Britain hoped that Hong Kong would make more progress toward democracy. India warned China on Friday that construction of a road near their common border would have serious security implications, as China’s Foreign Ministry denied its troops had violated the territory of India’s ally, Bhutan. The stand-off on a plateau next to the mountainous Indian state of Sikkim, which borders China, has ratcheted up tension between the two neighboring giants, who share a 3,500 km (2175 miles) frontier, parts of which are disputed. According to the Chinese interpretation of events, Indian guards crossed into China’s Donglang region early in June and obstructed work on a road on a plateau. Troops from the two sides then confronted each other close to a strategic valley controlled by China that separates India from Bhutan and gives China access to the so-called Chicken’s Neck, a thin strip of land that connects India to its remote northeastern regions. Bhutan said on Thursday that the road was being built inside its territory. 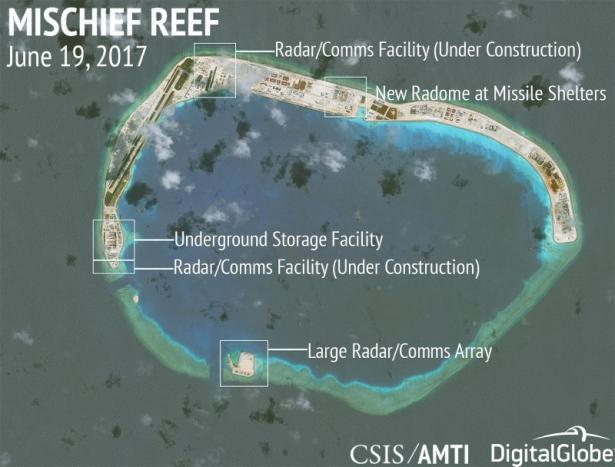 Indian media have reported that the dispute began when China removed an old Indian bunker. “India is deeply concerned at the recent Chinese actions and has conveyed to the Chinese Government that such construction would represent a significant change of status quo with serious security implications for India,” India’s ministry of external affairs said in a statement. “It is essential that all parties concerned display utmost restraint and abide by their respective bilateral understandings not to change the status quo unilaterally,” the ministry said. Chinese foreign ministry spokesman Lu Kang said the road work was going on in an area that was on the Chinese not Bhutanese side. China and Bhutan have yet to reach a final agreement on demarking their border. India’s army chief visited the mountainous state of Sikkim bordering China on Thursday, where tensions have flared after Beijing accused New Delhi of sending troops into its territory and obstructing the construction of a road. Small incursions and troop stand-offs are common along other parts of China and India’s contested 3,500 km (2175 miles) frontier, but a flare-up near strategically positioned Sikkim is rare. General Bipin Rawat arrived in Gangtok, the capital of the tiny Himalayan state, before heading off to visit troop formations. A spokesman for the Indian army said the one-day trip was “routine” and planned before the recent tensions. Reports of the incursion and a confrontation between troops emerged as Prime Minister Narendra Modi arrived in Washington to meet U.S. President Donald Trump on Monday, the latest in a line of stand-offs reported during diplomatic initiatives. India has deepened its military ties with the United States in recent years, worrying China, which is also unhappy with India’s refusal to participate in Beijing’s multi-billion-dollar Belt and Road infrastructure initiative. 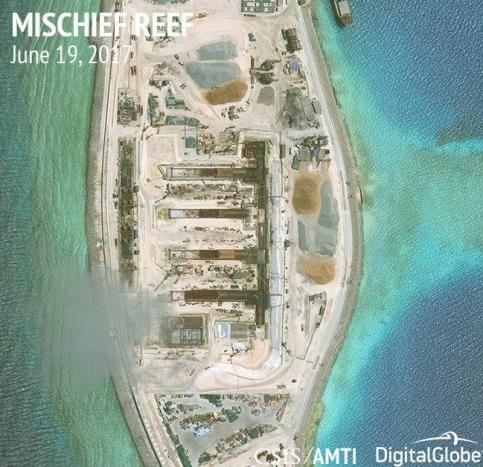 India is concerned the project could cement China’s dominance over Asia. According to the Chinese interpretation of events, Indian guards crossed into the Donglang region earlier in June and obstructed work on a road on a plateau. The two sets of troops then confronted each other close to a highly strategic valley controlled by China that separates India from Bhutan – a close Indian ally – and gives China access to the so-called Chicken’s Neck, a slither of land that connects India to its remote northeastern regions. China says that unlike other parts of their shared border, the delineation of the frontier with Sikkim is settled, and it has the right to develop the area. 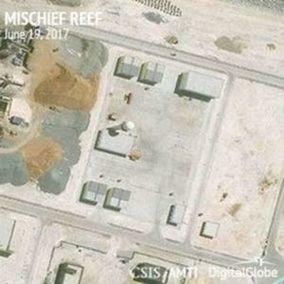 Late on Thursday, the ministry released on its website two photographs it said showed Indian troops and at least two Indian military bulldozers on what it said was the Chinese side of the border. The Nathu La Pass, which lies on the frontier between Sikkim and Tibet, was the site of a fierce border clash between Chinese and Indian troops in 1967. The United States plans to sell Taiwan $1.42 billion in arms, the first such sale under the administration of Donald Trump and a move sure to anger China, whose help the president has been seeking to rein in North Korea. U.S. State Department spokeswoman Heather Nauert told reporters the administration had told Congress of the seven proposed sales on Thursday. “It’s now valued about $1.42 billion,” she said. The State Department said the package included technical support for early warning radar, high speed anti-radiation missiles, torpedoes and missile components. Nauert said the sales showed U.S. “support for Taiwan’s ability to maintain a sufficient self-defense capability,” but there was no change to the United States’ long-standing “one China” policy, which recognizes Beijing and not Taipei. 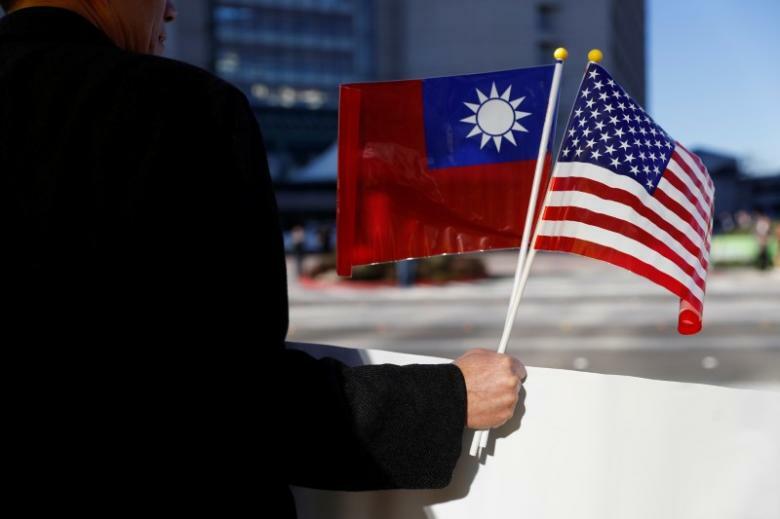 The sale, which requires congressional approval, would be the first to Taiwan under Trump and the first since a $1.83 billion sale that former President Barack Obama announced in December 2015, to China’s dismay. Taiwan’s defense ministry said the items would enhance its air and sea combat capability and early warning defenses. “We will as soon as possible discuss with the United States the purchase, the duration, the amount and other details, and plan the follow-up budget,” the ministry said in a statement on Friday. It said Taiwan and the United States would continue to consolidate their security partnership to contribute to long-term stability in the region. In a strong sign of congressional support, the Republican chairman of the House Foreign Affairs Committee welcomed what he called the “long-overdue” arms sale. “Sales of defensive weapons, based on Taiwan’s needs, are a key provision of our commitments as laid out by the Taiwan Relations Act and the Six Assurances,” said Rep. Ed Royce, referring to legislation and informal guidelines that steer U.S. relations with Taiwan. U.S. officials said in March the administration was crafting a big arms sale to Taiwan, but such talk died down as Trump sought to persuade Beijing to do more to rein in North Korea’s nuclear and missile programs, an increasing threat to the United States. Earlier on Thursday, China responded angrily and said it had protested to Washington after a U.S. Senate committee approved a bill calling for the resumption of port visits to Taiwan by the U.S. Navy for the first time since the United States adopted a one-China policy in 1979. 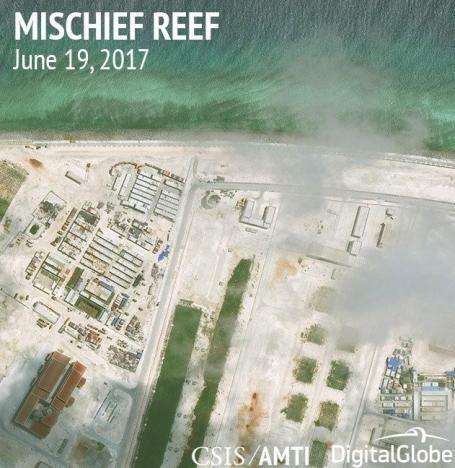 The bill also directs the Pentagon to help Taiwan develop an indigenous undersea warfare program and recommends strengthened strategic cooperation with Taipei. U.S. officials told Reuters this week that Trump – who alarmed Beijing after assuming office by breaking with decades of precedent and talking to Taiwan’s president – was becoming increasingly frustrated with China over its inaction on North Korea and trade. According to the officials, Trump is now considering trade actions against Beijing, despite having heaped praise on Chinese President Xi Jinping after an April summit. Also on Thursday, Washington stepped up pressure on Beijing by imposing sanctions on two Chinese citizens and a shipping company for helping North Korea’s nuclear and missile programs and accusing a Chinese bank of laundering money for Pyongyang. China’s ambassador to Washington said the arms sales to Taiwan and sanctions against Chinese companies would hurt bilateral relations. Ambassador Cui Tiankai, speaking to reporters at an embassy reception, said, “And all these actions, sanctions against Chinese companies and especially arms sales to Taiwan, will certainly undermine the mutual confidence between the two sides and runs counter to the spirit of the Mar-a-Lago summit.” Trump and President Xi Jinping met in Florida in April. 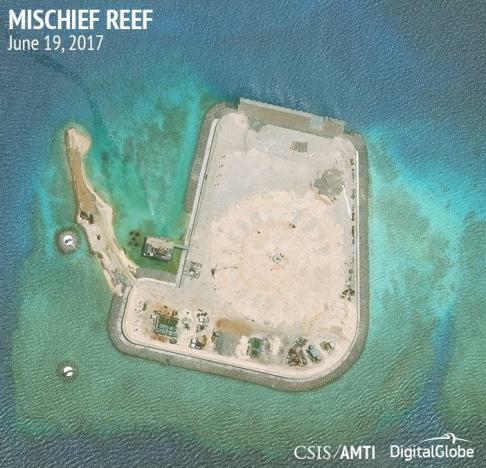 “We are against this kind of long-arm jurisdiction by the U.S. side,” Cui said. China’s legislature passed a new intelligence law on Tuesday after an unusually brief round of discussions, a draft of which gave new powers to monitor suspects, raid premises and seize vehicles and devices. President Xi Jinping has overseen a raft of legislation to bolster national security against perceived threats from both within and outside China. The government gained new powers with a national security law passed in 2014, followed by measures on counter-terrorism, the management of foreign non-government bodies and cyber security, among other subjects. On Tuesday, the standing committee of the National People’s Congress (NPC) passed the law, the largely rubber stamp body said in a short statement on its website. The law will go into effect on Wednesday, it added, without giving details of what was in the law or how its contents had changed since a draft was circulated in May. A draft was only released for one round of public consultation that lasted three weeks. Laws are often subject to at least two rounds of consultation, or more if controversial. The legislation was also passed after only two rounds of discussion by parliament’s standing committee. Laws often go through three or more rounds. State news agency Xinhua said last week that the law was “needed to ensure the nation’s security interests are met”. Intelligence work needs to be performed both within and outside China, and foreign groups and individuals who damage national security must be investigated, according to the draft. The law will give authorities new legal grounds to monitor and investigate foreign and domestic individuals and bodies, in order to protect national security. Chinese activists have said they fear intensified state surveillance. China already has broad laws on state secrets and security but the new law will allow intelligence officials to enter “restricted access areas” and use “technological reconnaissance measures” when required, according to the draft. Vehicles, communication devices and even real estate, such as buildings, can be used or seized by authorities during intelligence gathering efforts, the draft says. Western governments have spoken out against China’s security measures as defining its national interests too broadly and warning they could be used to target dissent. China’s new Type Rejuvenation high-speed train. Photo from CCTV footage. 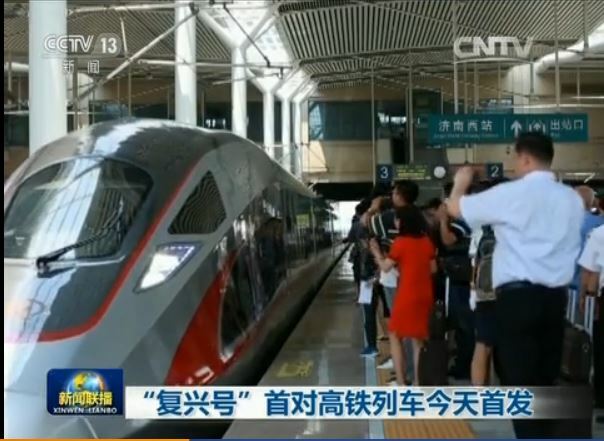 A pair of China’s new high-speed trains Type Rejuneration began operation on June 26 between Beijing and Shanghai according to CCTV primetime news on June 26. Its highest operational speed is 300 km per hour so that the travel between Beijing and Shanghai is only about 5.5 hours. However, its test speed has reached 400 km per hour. The train is fully automatic and due to its improve shape, its per passenger per 100 km energy consumption is 8% to 12% less than the previous Type Harmony version. As its inside height is 4 meters, 0.3 meters higher than Type Harmony, passenger are more comfortable with larger space. 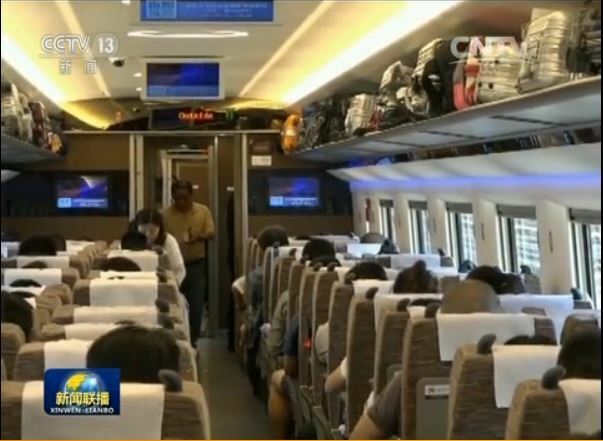 Inside China’s Type Rejuvenation new high-speed train. Photo from CCTV footage. There will be an additional pair in service between Beijing and Shanghai after July 1.